The greatest blessing about running a children’s foundation is having the opportunity to meet the most beautiful and brave little souls. Jake Matthew Staniszewski was an incredible little boy that I was lucky to have spent time with. 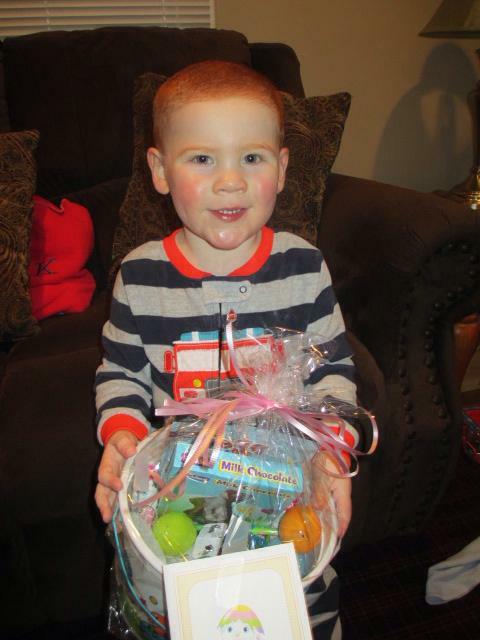 Two year old Jake battled alveolar rhabdomyosarcoma, an aggressive pediatric cancer. From the moment I met Jake I fell in love with his sprit and bravery. Jake had the most vibrant personality, heart-warming smile, and the most beautiful blue eyes. In the face of sickness Jake never ceased to amaze me with his strength, laughter, and love that he shared. Jake changed my life. He taught me how to love in an extraordinary way. He allowed me to see life in a new perspective. Jake and his family taught me the true meaning of unconditional love and to appreciate every moment we have with those we care about. While Jake did not get his miracle, I believe knowing him was a miracle in and of itself. When Jake passed away I promised myself I would forever do good everyday in his honor. Jake’s story would never be forgotten. I would find a way to continue spreading all the love Jake and his family shared. In an effort to share Jake’s love and bring comfort to children battling chronic illnesses I started Jake’s Jammies. Jake’s Jammies involves collecting new pajamas, pressing them with a special logo and tagging them with a special card that shows a picture of Jake and shares some words about him. The Ashley Wade Foundation distributes these pajamas to many local hospitals in Jake’s honor. I am proud to share that in a few short months numerous schools, families, and organizations have rallied their communities to hold pajamas drives. The success has been overwhelming. This week we reached 1,000 pairs of pajamas and many more donations continue to arrive each day. My heart is full of gratitude and happiness. 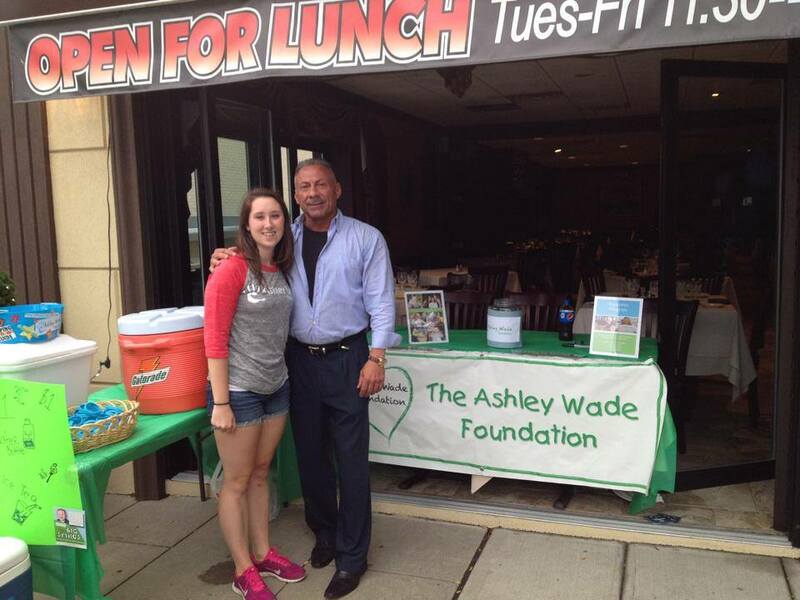 I thank you all for supporting Jake, his family, and The Ashley Wade Foundation. Thank you for helping spread Jake’s love and his story. Jake touched so many lives and continues to do so everyday. Mark, Denise, and Luke thank you for sharing Jake with us. We all love you so much. Last Sunday we held our annual Winter Wonderland party for all of our Superstar Families. Superstar families are families with children battling a chronic illness between the ages of one-twenty one. These special days are completely free to the families. It is our hope that family funs provide a safe, loving environment where parents can meet other parents who walk similar paths and can connect and support each other. The children are able to walk in the room and not feel so alone. The other children around them are battling the same illness or other illnesses that they can relate too. The holiday party was our biggest party to date and it was a BLAST! We had everything from Santa, to cookie decorating, to arts and crafts, to customized water bottles. There was so much love involved in setting this family fun day up that was completely sponsored by generous local businesses and families. One of my favorite moments at our family fun days is watching our Superstars and their Star Siblings make friends with other kids who are “just like them.” For me and for many of our Superstar kids they struggle with their illnesses and often feel that it is a “bad” part of them. Everyone at the AWF strives to make sure our Superstars know how special they are and that we are here to celebrate their differences. For me there was no greater gift than seeing all our Superstars laughing, smiling, and most importantly feeling so comfortable being exactly who they are. I cannot thank everyone enough for following our AWF journey on facebook and supporting us throughout the year. 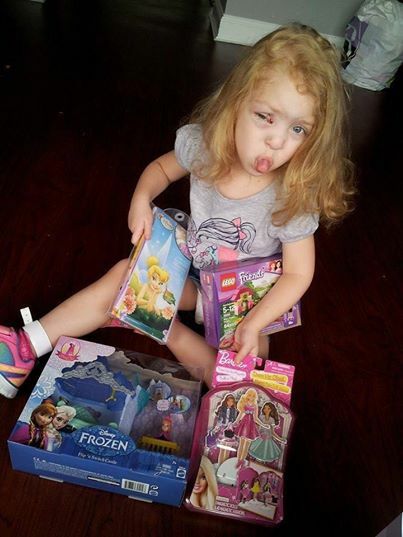 Whether it be donating a toy, making a monetary donation, volunteering your time or even just sharing our posts you are helping to make a difference in the lives of many sick children. Thank you for helping us bring so much happiness, comfort, hope, and love to the bravest of the lives. Special thanks to our holiday sponsors : Holiday Inn Plainview, Homes By Mara, Camps R US, Cakes By Kim, Enchanting Events of NY, Lifevac, Cullen and Dykman, Everyday photography and Treats, Zonas, Danielle Santaniello, Suite Pieces, Miss New York Jamie, Sun Buick GMC of Nassau, The Drapery Lady Studio, DJ Kid, Phyllis, Party Couture, and Fran. Lastly, thank you to my team members and volunteers who work endlessly day in and day out bringing happiness to all our Superstars. This has been an incredibly long week. We were recently selected as a finalist for the Ryan Sheckler “Be The Change Award.” This award is given in the form of a 10,000 grant to the winner. I sit down everyday and just imagine all the children and families I could help with that amount of money. I can make sure I go to every hospital on Long Island and hold pizza parties for the kids. That would allow us to start our program in loving memory of our Superstar Jake who passed away earlier this month. 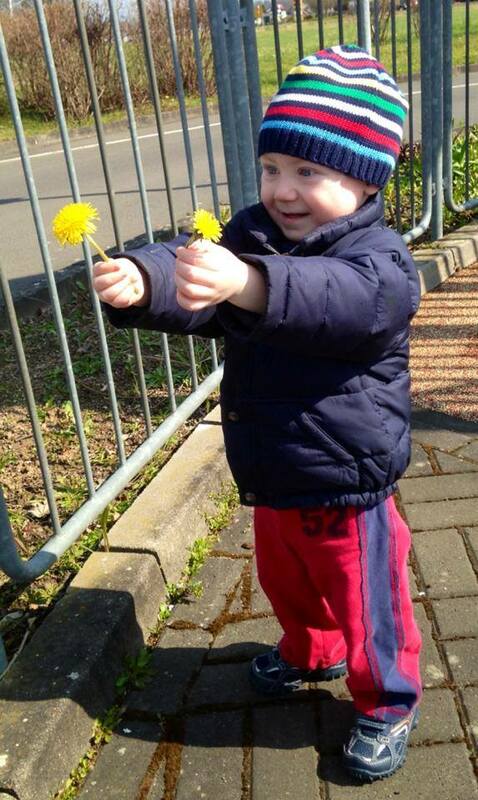 Jake was an amazing little boy, I fell in love with his spirit and bravery. I promised myself I would do something in his honor. I will do everything and anything to make it happen because Jake deserved the world just like every other kid battling an illness. These children fight so hard every day just to be normal, and sometimes just to be alive. The least I can do is try to bring a smile to their face, and help them for a brief moment forget about their illnesses. We just got these super cool t-shirt for our Superstars that we will be giving out at our family fun day on August 26th. They say “I am an AWF Superstar and I am stronger than my diagnosis.” I can’t wait to give them to the kids and watch them smile as they put it on. I know something as simple as a t-shirt will bring a smile and empower them to continue to be brave. These shirts will most importantly make them feel special. I can’t explain the feeling of delivering a care package, a gift, or even just visiting a Superstar Child and their family. It is the greatest feeling in the entire world when their face lights up despite the overwhelming obstacles they are facing for that moment they are happy. For that moment they are all smiles. Although I cannot explain to you what its like just close your eyes and picture for a moment. Walking into a house, hospital room, a treatment center, where a child is fighting so very hard and you come in with a huge basket of toys. 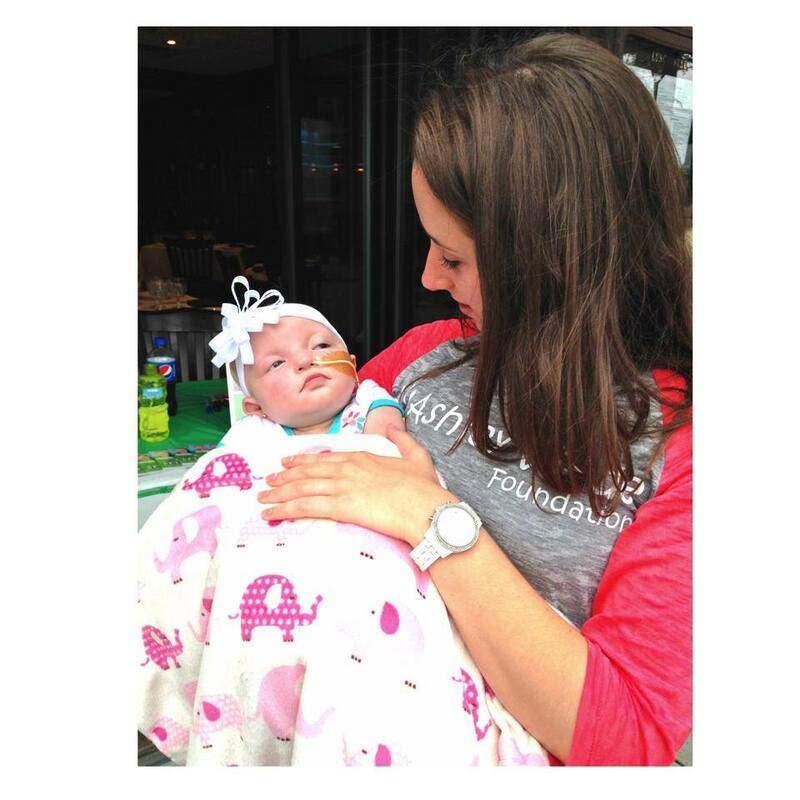 The next moment that child is laughing, and smiling, they may of just sat up for the first time in a week. You bring pizza and the child has agreed to eat for the first time in days. These are the moments that continue to motivate us. That push up to keep fighting for our foundation for these children. Sometimes, you help the parents more than anyone. I can’t imagine how hard it is for a parent to watch their child endure so much but I do watch the sense of relief and happiness that overcomes them when we come visit their child. I can’t imagine for a moment having to turn away a family or a child from being in our Superstar program. But there are days where my team and I are struggling to find ways to fundraise and collect toys. I am proud to say that I have the greatest team and I am lucky to work along side them. I have been blessed to find people who want this just as much as I do and who care so very much about these children and their families. I have seen the amazing generosity and kindness of complete strangers stepping forward to help whether its making a basket, donating a toy, a baked good, or simply helping to spread the word about our foundation. I have watched children get involved and want to help other children by holding lemonade stands, veggie stands, or donating their own toys. It is inspiring. This grant would allow us to bring smiles to the bravest of lives. It would mean everything to me, my team, and all of my Superstar families if you could rally your friends, and co-workers to keep voting for us so we can continue to bring joy to the children who deserve it most. This weekend we had the opportunity to attend the Massapequa Park Festival thanks to Ambrose of Maggie’s on Park along with Marilynne Mazzella Rich. From 11am- 6pm on Saturday and Sunday we got to meet some of our amazing supporters not only from Massapequa but also from the surrounding areas. The mayor of Massapequa Park even stopped by to support us! We gave out lollipops to all the children passing by our tent. During the fair we also sold ice tea and water bottles to help raise money to enable us to send more care packages. 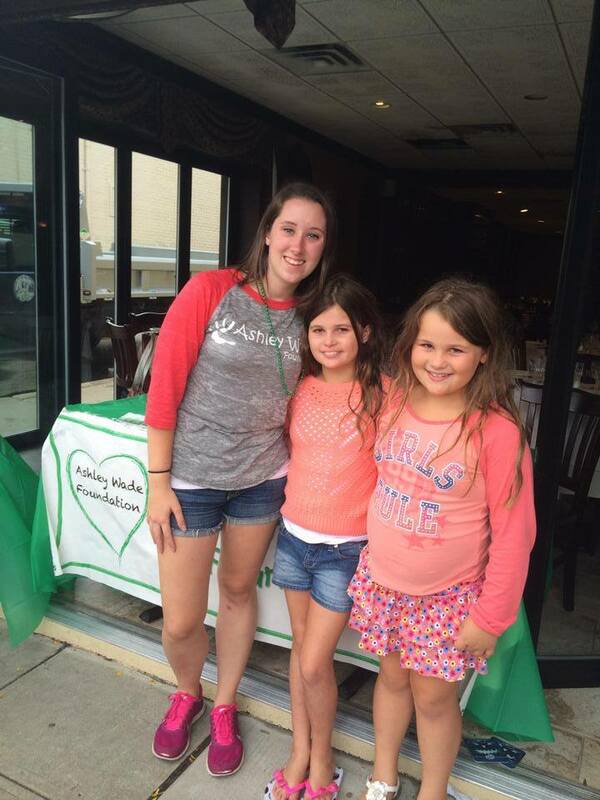 We were so excited that some of our Superstar kids stopped by to say Hi and support us. Special thank you to Melissa Cifka Weinstein, her husband Neal, and her children Cole and Paige for helping out all day Saturday!!! We couldn’t have done it without you. 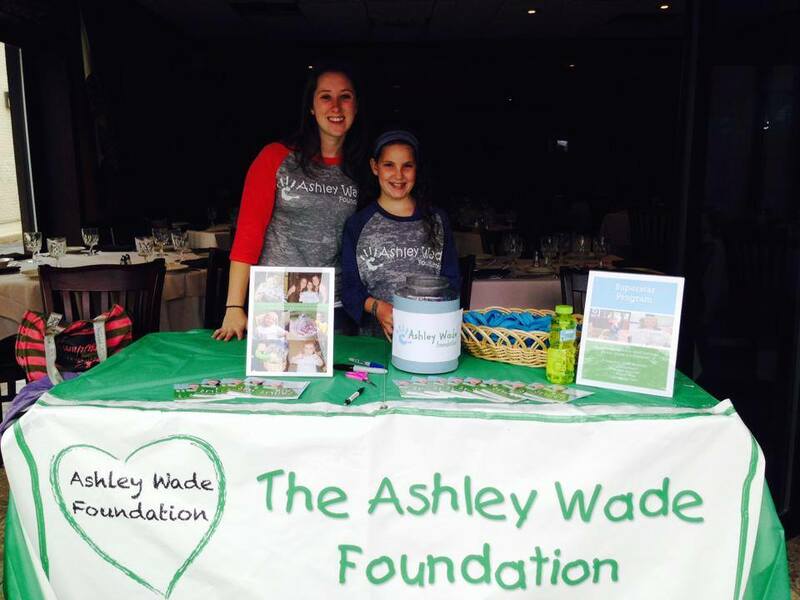 A lot has been going on at The Ashley Wade Foundation. Last week we officially became a 501c3 non profit organization. We are super excited and cannot wait to help so many more children! We are currently getting ready for our second family fun day which will be in August for our Superstar families. Family fun days are one of our favorite things as we get to meet so many Superstar families for the first time! 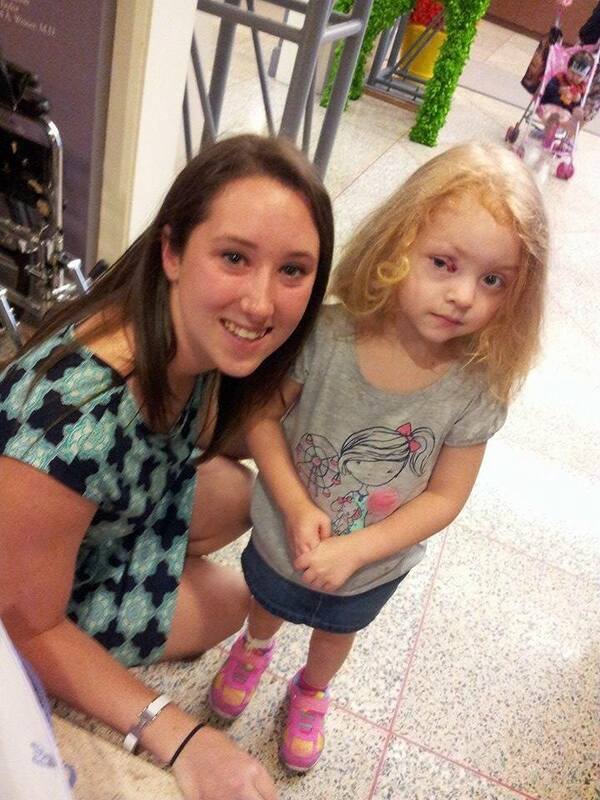 Yesterday, Ashley went to New York City to the Ronald McDonald House to visit our Superstar Chloe. 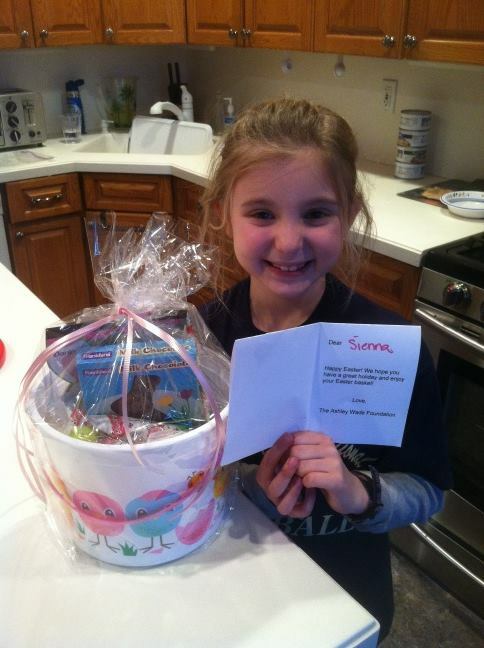 Chloe is staying at the Ronald McDonald house for two weeks while she recovers from surgery! 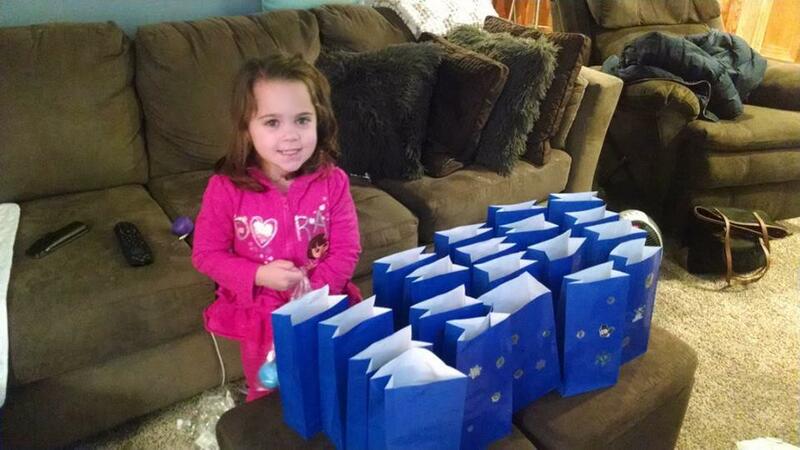 Ashley brought Chloe and her sister gift bags filled with a bunch of toys to make their stay a little better! 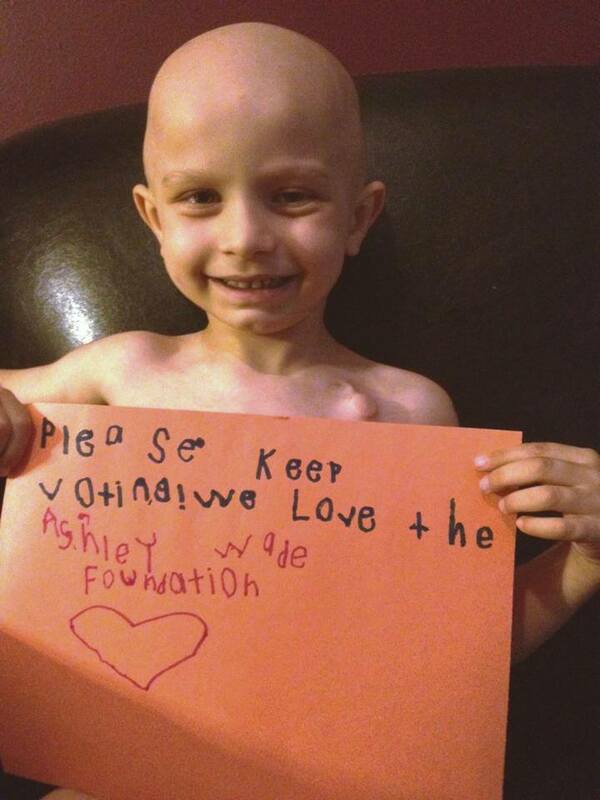 2013 was a great year for The Ashley Wade Foundation. 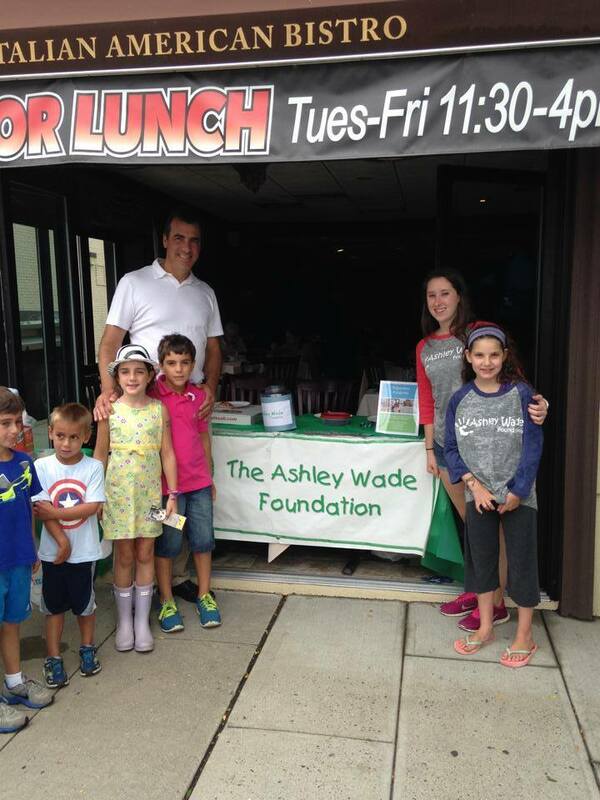 In September we held our 2nd annual fundraiser which raised over 4000 dollars! In November we began holding hospital parties in Winthrop Hospital once a month. In 2013 we also started our Superstar Program which proved to be a huge success. We have already welcomed 9 children and their families into our Superstar program! Thank you for all of your continued support and love! We wish everyone a happy and healthy New Year!! *Our new website will be released soon! 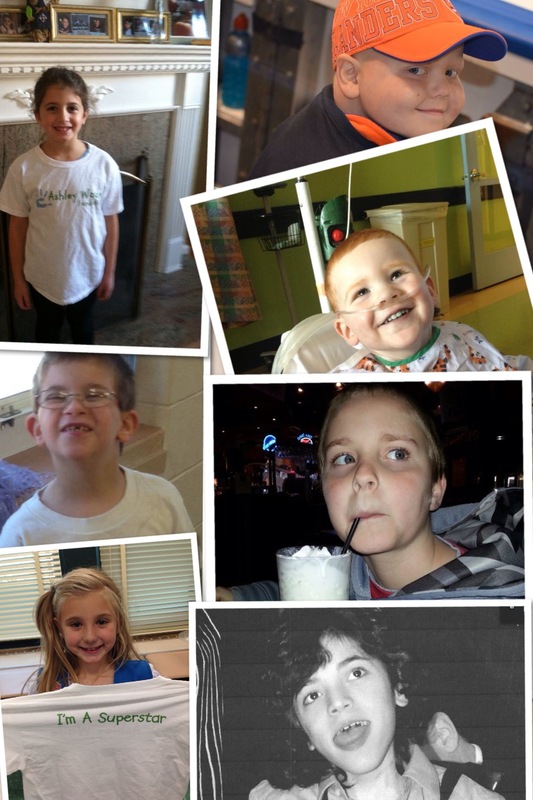 *Below is a collage of our 2013 Superstar Kids. Missing is Camryn and Owen. Hi guys, somewhere between baking Christmas cookies and wrapping care packages I decided to create a blog. There is always something new happening at the foundation and we wouldn’t want you guys to miss it! I figured this is the best way to keep everyone updated. There are so many special children that we get to meet and I want to make sure I tell you guys all about them! We also get to meet new friends when we hold parties at Winthrop hospital each month. I will be sure to tell you about those parties and even post some pictures! I will also introduce you to some of the amazing people I get to work with and my awesome volunteers. I am new to blogging so bare with me!